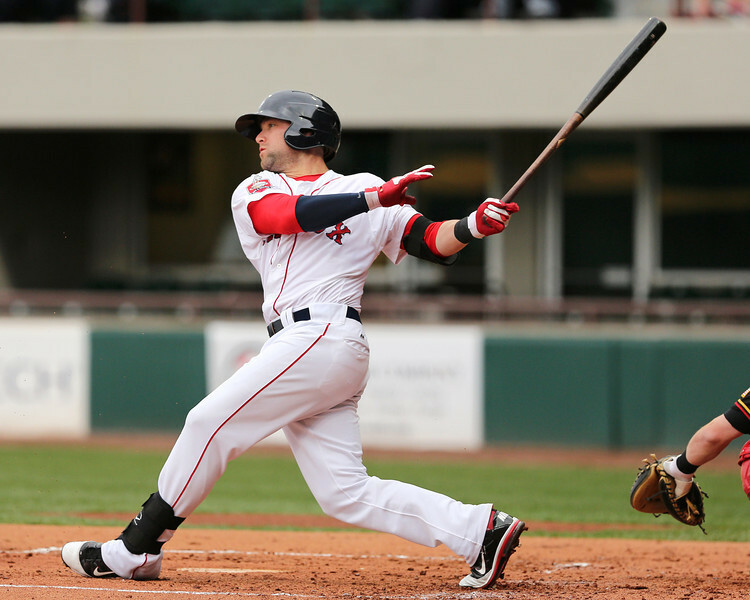 In this edition of The Write-Up, Chaz Fiorino provides detailed scouting notes from McCoy Stadium based on games scouted on May 2-4. 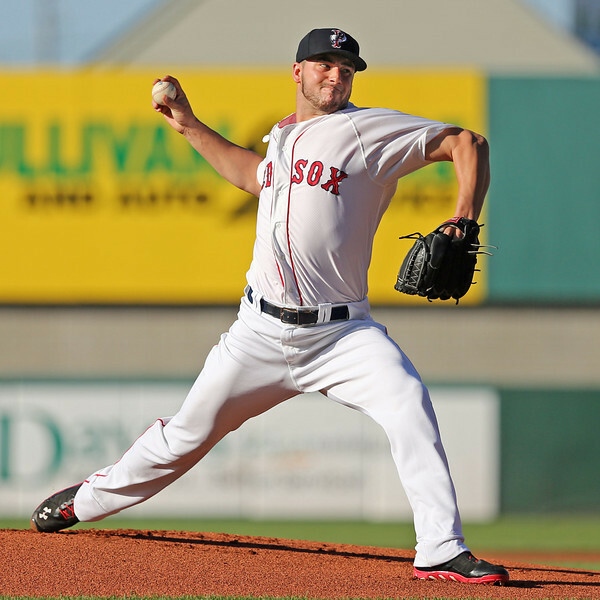 Workman put together his best start of the year to that point on May 2 in his fourth outing with Pawtucket. Workman likes to pound the zone and challenge hitters with his fastball, which sat 90-92 mph. Although he throws it with average velocity, the pitch plays up due to his ability to command it. He struggled with his release point early, walking a hitter in each of the first three innings, all left-handed hitters. 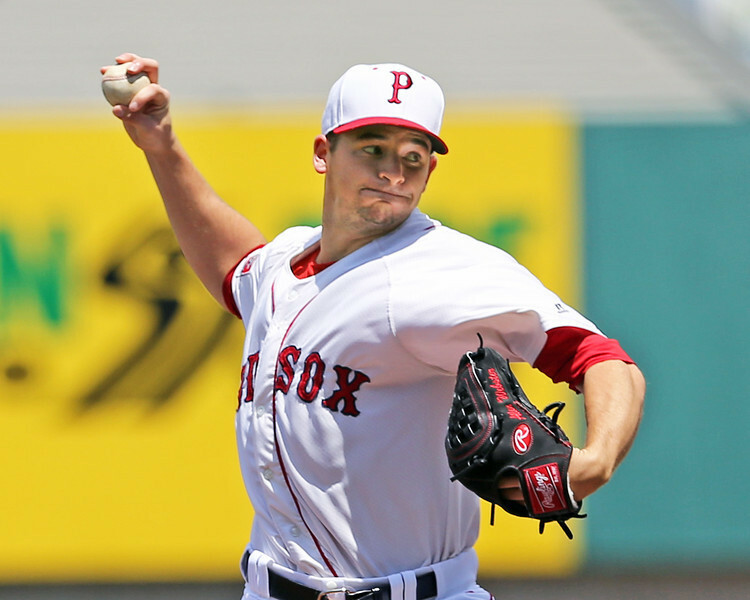 Workman has yet to walk a right-handed hitter in his now five starts with Pawtucket this year. Workman eventually settled in, getting through 5 2/3 innings on 96 pitches. In addition to the fastball, Workman mixed in his curveball at 78-79 mph, a cutter at 84-85, and a changeup at 83-85. The curveball is Workman’s best secondary pitch. It has true 12-to-6 action when he is able to effectively get on top of it. As Workman worked through the order the second time around, he began mixing in more curveballs and cutters. The changeup is his fourth offering and grades below average. He seemed to yank the changeup, making it hard to distinguish from the cutter at similar velocities. Workman did a great job at changing speeds and establishing the curveball in innings four through six. Five of his eight strikeouts came on the curveball. Workman really began to look comfortable and was coasting through the last couple innings, striking out five of the last eight batters he faced and retiring eight of the last nine. He would have been able to work a lot deeper into the game had he not run his pitch count up early while settling in and trying to find his release point. I didn’t have any official times on Workman’s time to the plate, but it’s also worth noting that he is fairly slow, which resulted in two stolen bases against. 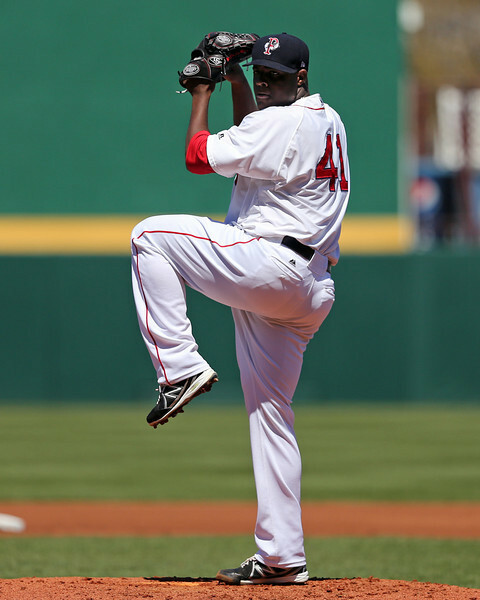 De La Rosa had four great starts to begin 2014, which earned him SoxProspects.com Pitcher of the Month honors in April. He has since struggled in back-to-back outings. In this outing, De La Rosa’s fastball was sitting 90-94 mph and touching 96. In addition to the fastball, he featured a long, three-quarters slider at 85-87 with early, sharp break, grading about average. He also changes speed with his breaking ball, throwing a few in the 76-79 range that could be classified as curveballs based on velocity, but with the same action as the slider. The harder version of his breaking ball is a lot sharper. The last piece of his arsenal in this start was a changeup at 84-87 mph with decent fade away from left-handed hitters. While the fastball mainly sat 91-93, De La Rosa showed the ability to dial up to 96 when needed. In the third inning, with runners on second and third and two outs, De La Rosa faced Pirates top prospect Gregory Polanco, one of the hottest hitters in the minors in April. Ahead in the count 0-2, De La Rosa spotted a well-located fastball down in the zone at 96 mph to strike out Polanco swinging. Overall, De La Rosa had his traditional pure stuff. The issue was mainly with his overall command and delivery. De La Rosa’s command came and went all outing as a result of getting too quick with his delivery and rushing at times. There was a little added effort in the delivery where he did not look as free and easy as previous outings in early April. De La Rosa also began throwing a heavy dose of sliders early and often in counts, and actually doubled up on the slider on at least three occasions to begin an at-bat. He also showed a willingness to try and backdoor the slider to left-handed hitters on the outside corner. The pure stuff has not taken a step back for De La Rosa from previous starts this year, but getting back to slowing things down from an effort standpoint in the delivery will be the key going forward. Webster put together his third straight quality start last Sunday. He featured his fastball topping out at 95 mph, sitting 91-94 with his usual quality sink. His slider came in at 85-87 mph in the outing with long, three-quarters shape and late break. His changeup grades as his best off-speed offering, an above-average pitch he can throw with great arm speed, making it hard for hitters to pick up. It sat 83-85 mph with more fade to left-handed hitters than sink. Webster also threw a loopy, below-average curveball at 76-79 mph. He did not really throw the curveball until the sixth inning, at which point he threw five of them in that inning alone. This usage fooled hitters, suddenly giving them a fourth pitch to think about that they didn’t see the first time through the order. I felt that Webster was pitching with a bit more confidence this outing, particularly with his secondary pitches. Most notably, in the sixth inning, with the go-ahead run on second and two outs, Webster faced former Red Sox prospect Chris McGuiness. Webster fell behind in the count 3-1, but rather than giving in and giving the hitter a fastball to hit, he went to his changeup for strike two. With the count full, he threw the curveball, getting McGuiness to pop out and end the inning. Webster seemed to have feel for all his pitches on Sunday, giving him the ability to pitch with confidence and throw his secondary pitches in any count. Brentz can be one of the more frustrating hitting prospects in the system. He is the definition of a guess-hitter, and is more often wrong then right; a dead-red fastball hitter who does not have the ability to effectively recognize pitches and wait for his pitch. Pitch recognition and discipline is not generally a skill that develops late in a player’s career either. Brentz did generate three walks during these games, but on two of those—one on four pitches and the other on five—all four balls were not even close. All four of his strikeouts came on breaking balls out of the zone. Some examples from this series show his issues. In Brentz’s second at-bat on Friday, he came to the plate with runners on first and third with no outs. He came out first-pitch swinging at a curveball in the dirt. After getting the count even at 1-1, Brentz got his pitch, a fastball middle-away that he could drive to right field, but he took this pitch for strike two. With the count at 2-2, he struck out swinging on a curveball down out of the zone. On Saturday, his night included an 0-2 strikeout on a slider down and away, out of the zone. His next at-bat was a strikeout on a 1-2 slider in the dirt. He finally made an adjustment in his fourth at-bat of the night. With the count 2-1, he finally passed on a slider out of the zone. With a 3-1 count, hunting fastball, he did not get a pitch to hit and let it pass for a walk, resulting in what really was the only quality at-bat of the weekend that he had to work for. Defensively, Brentz has an easy plus arm that profiles best for right field. However, he has below-average range and gets fringe-average reads in the outfield, which may limit him to playing left field—or at least prevent him from playing right field regularly—in the majors. Although it was not on display this weekend, Brentz’s calling card is his well-known, above-average right-handed power, which could project for 30 home runs at the big level. However, his below-average hit tool may never play up enough for the power to play at the next level and make him an everyday option. These two plus tools make him interesting and will keep him around for a long time, but his other tools hold him back and keep him from taking the next step forward. He may be a short-term solution in Boston if a need arose, but I personally would feel uncomfortable with him as an everyday outfielder in the near future.